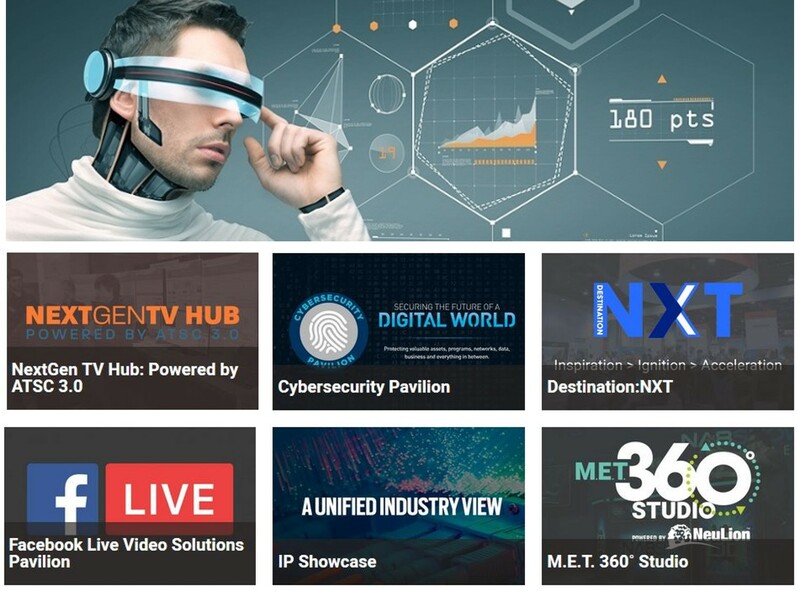 NAB Show is home to the world's largest collection of vendors driving the future of media and entertainment. From content creation to consumption, a myriad of solutions await you on the Show Floor and are organized into eight Exhibit Categories to allow for efficient exploration. Get the first look at new products, discover import/export opportunities, and experience next-generation technologies through interactive exhibits, live demonstrations and technology-focused pavilions. Prepare to meet with C-level executives, trendsetters, and technology gurus responsible for advancing the tools you need to succeed in a digital world. As of today we feature 76 companies and their approach at NAB2017 Show. This list is continously updated until NAB2017 opens on 24 April at the Las Vegas Convention Center. The link "NAB2017" will always show you the featured companies and events in alphabetical order. Blackmagic Design announced that Ghana’s largest private television broadcaster has completed an upgrade of its studio and outside broadcast facilities to support Ultra HD 4K production. The solution for GH One’s OBVan was built around 12G-SDI broadcast infrastructure products from Blackmagic Design. The multi studio complex, as well as a 14m long OB truck, were designed by system integrator Axel Technology, as part of a complete overhaul of the broadcaster’s production infrastructure. “A move to a new building facilitated the need for a new system, but it also gave the team the opportunity to design a flexible and futureproof workflow for the channel’s studio and OB locations,” begins Marco Branzanti, video projects manager at Axel Technology. Hannover-based TVN MOBILE PRODUCTION, one of Europe's largest outside broadcast fleet operators, has ordered five Leader LV5490 test instruments for use in its first UHD-HDR mobile production truck. Logic Media Solutions, Leader's Darmstadt-based channel partner, supported TVN during pre-purchase evaluation and will complete the delivery. "We made an extensive evaluation of the available UHD test equipment," comments TVN production engineer Holger Tadge. "The LV5490 is intuitive to operate and the real-time false-colour picture display is proving especially useful in ensuring we make the greatest possible use of the UHD-HDR headroom in content we deliver to our clients." Imagine Communications, empowering the media and entertainment industry through transformative innovation, has provided the routing equipment at the heart of Gearhouse Broadcast’s new 4K/UHD-ready production truck, known as Columbus. The award-winning Platinum™ IP3 is a key element of the mobile unit’s core infrastructure, providing multi-format signal distribution capabilities, including support for HD, 3G and 4K/UHD. The IP-ready router is also designed to provide Gearhouse with the ability to seamlessly transition to IP-based operations in the future. The new mobile unit — along with Gearhouse engineers — is available for hire for all types of live productions events across North America. Columbus demonstrates the company’s ongoing commitment to expanding in the U.S. Gearhouse Broadcast USA’s service offerings include a complete range of mobile units, project solutions, fly pack systems, specialist equipment rental, equipment sales and event communications. La Chaîne Parlementaire-Assemblée nationale (LCP), the television channel of the French National Assembly, has installed Axon’s Cerebrum control and monitoring system as part of a major upgrade of its news production facilities. The channel, which broadcasts 24-7 over satellite, cable, OTT, IPTV and DTTV (Digital Terrestrial Television) with debates and commentary on major national and international political issues, has switched its entire infrastructure to High Definition – now the default format in France. As part of this upgrade, technical equipment was also renewed to streamline the workflow and improve control and monitoring. The tender was awarded to Ericsson France, who undertook the design, integration and installation of the project. Public, education and government access (PEG) broadcaster Fitchburg Access Television (FATV) takes pride in bringing high-quality community programming to residents of Fitchburg, Massachusetts while also serving as a valuable partner to nearby schools. Unhappy with limitations of the HD cameras FATV had purchased from another vendor just two years earlier, the station replaced them with ten Z-HD6000 cameras from Hitachi Kokusai Electric America Ltd. (Hitachi Kokusai) to improve productions, simplify operations and meet its educational goals. FATV’s extensive production capabilities span across studio and mobile facilities. More than 200 shows per year are produced in the station’s two studios, while its mobile production truck powers live remote broadcasts for Fitchburg State University sports, high school and college football games, community events and more. The need to replace FATV’s existing cameras first became obvious in field use. For more than three years slomo.tv’s video judging system videoReferee® is used at various national and international basketball championships. Since 2015 the Lithuanian Basketball League (LKL) is using the videoReferee®-B for all its matches. The budget systems have been specially developed for video judging in basketball, with the LKL being the trailblazer in using the new model. The videoReferee® systems proved their reliability and ease of use and were therefore selected for video judging during the 2017 Basketball EuroCup in Lithuania. As part of the tournament several matches were played at "Cido" Arena (Panevezys, Lithuania) where Lietkabelis (Lithuania) has its home base, playing against teams FC Bayern Munich (Germany) and Khimki (Russia). Because the arena scoreboard controller could not be connected directly to the videoReferee® system, the system was used in five-channel configuration: 4 channels in normal mode for recording the game action and 1 channel for recording the scoreboard view. ChyronHego announced that the Deutsche Fußball Liga (DFL), one of the world's largest sports organizations, has signed a new four-year contract with ChyronHego to use the company's award-winning TRACAB™ image-based tracking system for Bundesliga and Bundesliga 2 matches. Installed in all 35 DFL arenas, TRACAB will continue to collect real-time ball and player-tracking data and enable powerful team and player insight for the 36 DFL football clubs over the next four years, representing a total of almost 2,500 matches. As part of this announcement, ChyronHego will be working in close partnership with the new subsidiary of the DFL, Sportec Solutions GmbH, which provides data gathering, storage, and distribution for Bundesliga and Bundesliga 2. Sportec Solutions is a new innovation hub for sports technology in German football, driving converging technologies such as a video-assisted replay center, wearables, and new goal-line technology. As part of its ongoing engagement with Perform Group, Reality Check Systems (RCS) recently completed a head-to-toe graphics redesign for DAZN, Perform Group’s live and video on-demand sports streaming service, available in Japan, Germany Austria and Switzerland (DACH). RCS designed and built all new visuals to enhance the viewer experience, in addition to delivering improved data integration, production infrastructure advancements and more. The new look recently debuted alongside the launch of DAZN’s J.League soccer programming. RCS envisioned an eclectic mix of vibrant and engaging new looks, drawing on inspiration from the DAZN brand. Once approved, the looks were then translated into a complete graphics package. Though RCS built the graphics to support German and Japanese, they also incorporated English language character sets to future proof for potential DAZN expansion. Workflow and data integration improvements were also implemented to improve production efficiency and audience engagement. The critically acclaimed hyperactive British comedy superstar, Russell Howard, is clearly in record-breaking mode at the moment with his biggest global tour yet, “Round the World”. He recently completed a sold-out 10-day run at the Royal Albert Hall, smashing the record for consecutive performances at the venue previously jointly held by Frank Sinatra and Barry Manilow. The same show also took the record for the largest number of EM Acoustics HALO-C elements – 110 in total - for a single show. System design and equipment supply was courtesy of RAH veterans, Dave Shepherd (who acted as system tech) in conjunction with Delta Sound. Petrolhedz and adrenaline junkies were treated to a new look for the Live Action Arena at the 2017 Autosport show staged in Hall 5 of the National Exhibition Centre (NEC) in Birmingham, UK. An audacious, eye-popping lighting design by Nathan Wan featured nearly 300 Robe moving lights to provide the power, punch and luminosity needed to match the roaring engines, burning rubber and screeching brakes of the races and performance car action! Nathan has lit the show for the past few years working with technical consultants and equipment suppliers Network Productions. This year their technical director Nick Halliday and production manager Dave Beel were working with a new creative team who wanted to inject some turbo-charged theatricality into the tyre-slaying speed drama unfolding on the track. Bolero runs over a standards-based AES67 IP network. Decentralized antennas connect to AES67 switches and then to Artist frames equipped with AES67 client cards, providing a fully integrated point-to-point intercom ecosystem with seamless roaming capabilities. To the system, the beltpacks look just like Riedel panels but are wireless, providing the highest levels of flexibility and programmability. The Bolero high-clarity voice codec provides both higher speech intelligibility and more efficient use of RF spectrum supporting twice the number of beltpacks per antenna for the same audio bandwidth as other DECT-based systems. The codec has exceptional latency characteristics while being very efficient with processing power, providing excellent beltpack battery life, and saving DSP processing power for other functions. Throughout Bexel's 35-year history, we aim to provide technologies that add production value to live TV and bring an exciting, new dimension to viewers, but we recognized an increasing demand for high-quality, real-time HFR video that no manufacturer addressed. In response, Bexel developed a small POV camera that provides the same functionality as a large high-speed camera. The result is Bexel Clarity Camera, the world's first miniature, high-frame-rate (HFR), point-of-view camera for live production. The Clarity 800-HD is a true game-changer for live broadcast, allowing for HFR to be easily used in any application. Stage Tec, the Berlin based manufacturer of professional audio equipment, presented AVATUS at prolight+sound, the new mixing console concept with ground breaking technology and contemporary look & feel – a fully IP-based large mixing console with 21" multi-touch displays. Control elements and interfaces are connected through standard Ethernet. The console control surface and other elements communicate via IP networks, enabling remote production. The interface is highly flexible, which enables customised function assignments. The operating philosophy is less technical, and Stage Tec has equipped the AVATUS mixing console concept with workflow oriented controls. For example, the touch displays provide context related functions.